To all the Town Branch Trail supporters, we’d like to take this opportunity to thank you for helping us have a banner year and wish you a wonderful holiday season as we look forward to great things in 2015. We enjoyed seeing many of you at our outreach events throughout the year. We continued our tradition of having a booth at the Bike Lexington Family Fun Ride on May 31st and participated for the first time at the 8th Annual Rain Garden Tour on September 14th. This year, the tour was in the Meadowthorpe neighborhood, which is in the Town Branch watershed. We especially thank Russ Turpin with EcoGro for the invitation to participate in this year’s tour. Thank you for supporting us at these events, and please find us at similar events in 2015! We also want to thank the Fayette Alliance and the Bourbon Review for the Town Branch Cleanup in the distillery district on September 15th. Another exciting development is the transformation of the creekside in the Pepper distillery into a series of bar and restaurant venues that look out onto the creek. These are the kinds of adaptive reuses that we have long hoped for and it is a thrill to see them come to pass. We were pleased to welcome Amy Frost to the Town Branch Trail Board in 2014. Amy lives along the trail and uses it often, and she brings her enthusiasm for it to everything we do. 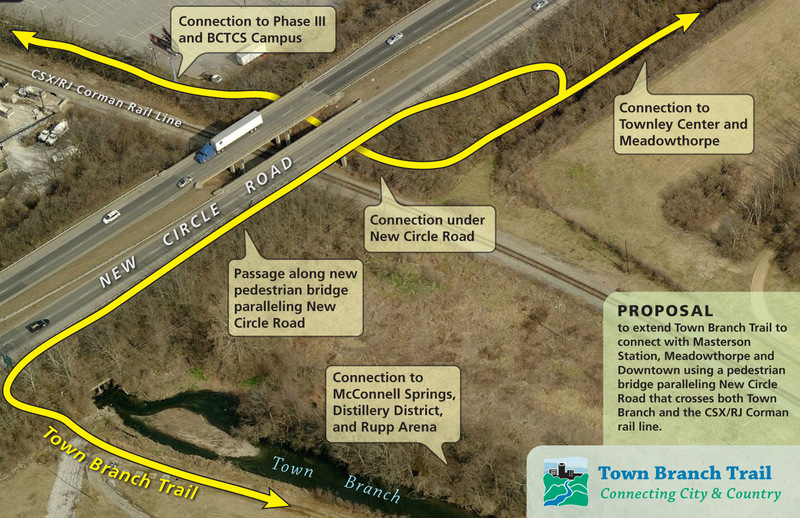 Many of you rallied to the cause as we worked together to persuade the Kentucky Transportation Cabinet (KYTC) to include a bicycle/pedestrian lane in the New Circle Road widening project, to get the trail across the creek and railroad tracks on the New Circle bridge. 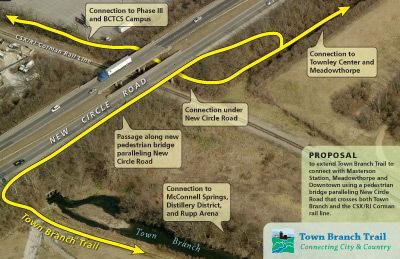 While we had been able to integrate the underpass we needed to connect under New Circle, we were not able to convince KYTC to give us that lane on the bridge. 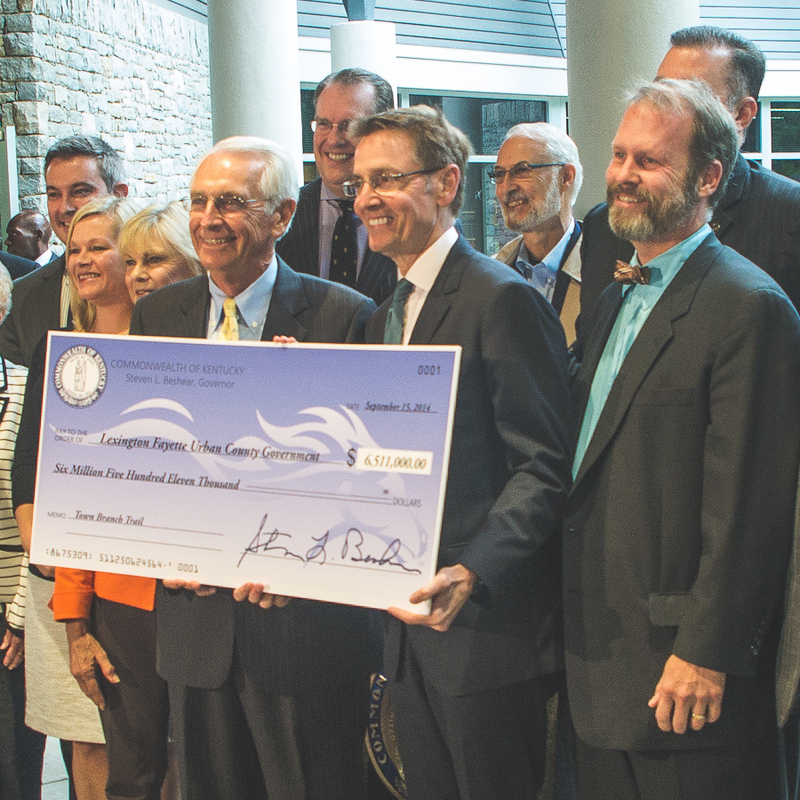 However, Governor Beshear heard your voices and committed $6.5 million to substantially complete Town Branch Trail! This allocation will fund a separate bridge and extend the trail across the creek and public property where it will terminate for an interim period at McConnell Springs. This grant will also fund the design of the trail through the Distillery District to Cox Street behind of Rupp Arena. The Governor hopes to be able to allocate further funding to complete the construction before he leaves office. The Governor’s commitment will complete the trail to where it segways into the Town Branch Commons (http://www.townbranchcommons.com). None of this could have been possible without the sustained public support and encouragement you have provided. Many thanks to all of you! Preliminary design is done for Phase Three of the trail, from Alexandria Drive to just outside New Circle Road. Final design must wait for major work by the railroad to be completed along the creek, since it affects where the trail can go. Once that work has been done, it should not take long for final design to be drawn up, followed by putting it out for bid. We will keep you posted. In breaking news, we are exploring the possibility of applying for a Five Star and Urban Waters Restoration grant for some water quality and/or stream bank improvement work along Town Branch somewhere in the Distillery District. This matching grant program “seeks to develop community capacity to sustain local natural resources for future generations by providing modest financial assistance to diverse local partnerships for wetland, riparian, … habitat restoration, urban wildlife conservation, stormwater management as well as outreach, education and stewardship.” We have many potential partners to bring together for this grant and hope to find a very visible place to install some “best practices” to protect and improve water quality in Town Branch. We anticipate that 2015 could be very exciting, as the design for Phase 3 is completed, and probably for Phases 4 and 5, too. So be on the lookout for an event announcement this spring, calling everyone to come together to celebrate that $6.5 million allocation and the progress which it makes possible. To help us increase the momentum in 2015, please consider a tax-deductible gift to Town Branch Trail, Inc. Please mail a check made out to Town Branch Trail, Inc., to 155 Constitution St., Lexington, KY 40507. Thank you, and have a great holiday season, and a Happy New Year. This entry was posted in News on December 16, 2014 by info. The Time is NOW! Make your voice heard! Lexington needs the Transportation Cabinet to help extend Town Branch Trail to connect with McConnell Springs and Downtown. Read additional information about this proposal. The Kentucky Transportation Cabinet (KTC) is in the final planning stages for a New Circle Road expansion project located between Georgetown and Versailles Roads. This is a once in 40-year situation. Town Branch Trail, Inc. a local advocacy non-profit, has formally requested that a section of the proposed Town Branch Trail that intersects and parallels the highway expansion be constructed by the state. Where the highway crosses the Town Branch Creek and the CSX/RJ Corman rail line between Leestown Road and Old Frankfort Pike, it can provide a passage underneath as well as a parallel bridge over these shared obstacles. This request would add less than 1% to the total project budget. Our request is in keeping with federal mandates, national transportation guidelines, and dozens of existing precedents from around the country. Thus far the Cabinet staff has refused our request. This is a rare opportunity for Lexington to reduce the overall cost of the trail while speeding up the project’s eventual connection with the distillery district, Rupp Arena, and Downtown. It is only practical that when the highway reconstruction occurs, parallel and interrelated bike/pedestrian transportation be included and constructed at the same time. Through an economy of scale and integration of logistics, this will lower taxpayer expense and time horizon for this long planned project to be realized. If the public speaks up quickly with one voice, we believe that the Cabinet will come around to acknowledging this timely and appropriate request. The time is short and we need your voice to be heard ASAP. The time is short and we need your voice to be heard ASAP. Town Branch Trail has been part of Lexington and state transportation long-range planning for over a decade. Putting bicycle and pedestrian facilities along highway bridges is now considered standard practice by national transportation guidelines. The US Secretary of Transportation, Ray LaHood, specifically calls for this type of integration. Adding a trail section will be a tiny fraction of the overall budget for the New Circle Road project, yet would achieve a huge leap forward for the trail, saving taxpayers time and money in the long run. The connectivity this will benefit the Masterson Station, McConnell’s Trace, Marehaven, Townley and Meadowthorpe neighborhoods. It will also connect the Leestown V.A., Military Reserve, and BCTC campuses with this citywide greenway corridor. It will decrease traffic congestion, improve air quality, increase recreational opportunities and otherwise contribute to a better quality of life. Investment and rising land values are very strongly correlated with the construction of these trails. This entry was posted in News on March 13, 2014 by info. Town Branch Commons weaves a linear network of public space along the 2.5 mile path of the historic Town Branch creek in downtown Lexington, Kentucky. 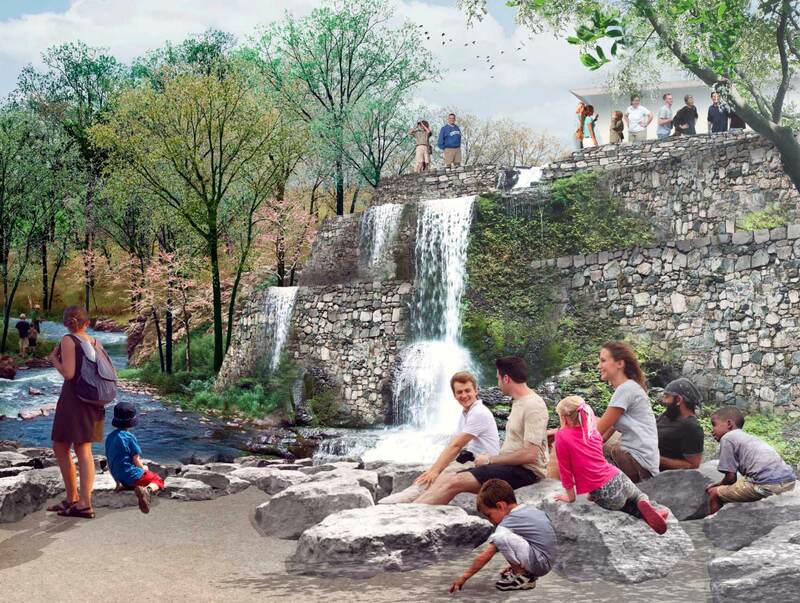 Once a waste canal, sewer, and water conduit for the city, the buried stream channel of Town Branch is an opportunity to reconnect the city with its Bluegrass identity and build a legacy public space network for the 21st century. Rather than introducing a single daylit stream channel into the city fabric, the design uses the local limestone (karst) geology as inspiration for a series of pools, pockets, water windows, and stream channels that brings water into the public realm. A hybrid park network, multi-modal trail system, and water filtration landscape, Town Branch Commons connects Lexington’s rural and urban communities and reinvigorates the downtown. SCAPE won the Town Branch Commons competition in 2013 and the project has grown to secure $23.1 million for design and construction for early phase design and construction. SCAPE is a design-driven landscape architecture and urban design studio based in New York. We believe landscape architecture can enable positive change in communities through the creation of regenerative living infrastructure and public landscapes. We work to integrate natural cycles and systems into environments across all scales, from the urban pocket-park to the regional ecological plan. We do this through diverse forms of landscape architecture – built landscapes, planning frameworks, research, books, and installations – with the ultimate goal of connecting people to their immediate environment and creating dynamic and adaptive landscapes of the future. Our staff is experienced in landscape architecture, architecture, urban design, horticulture, and planning, and we integrate these skillsets to practice design as interpreters and synthetic thinkers. We lead and work with teams of engineers and architects on complex projects, from stormwater streetscapes to large scale coastal infrastructure, translating technical expertise into legible and engaging public space. We also believe in working with communities and stakeholders to translate complex visions into realizable actions. We work with clients to ensure that design concept remains intact through the process of building landscapes. To achieve solid, high-performance public landscapes, we combine new technologies with tried and true construction techniques. We aim to create public landscapes of lasting significance, reconnecting neighborhoods and habitats for generations to come. Our work and collaborations have led to several national awards, including the Buckminster Fuller Challenge Winner, two national American Society of Landscape Architects awards, and a several NY American Society of Landscape Architects Awards. SCAPE was established in 2007. This entry was posted in News on September 15, 2013 by info. After two times around the track with horses, LexArts is basing its newest public art project on another Central Kentucky icon: bourbon barrels. The idea was floating around for a while and was done by Paris in 2010. But LexArts’ president and CEO, Jim Clark, said it needed the right confluence of events to persuade him to get behind the project. Town Branch Commons is a proposed 2-mile public space in downtown Lexington that would bring the historic, and buried, waterway to the surface for the first time in more than 100 years. A number of distilleries, including the Pepper Distillery, were along Town Branch; and Alltech, which is supplying barrels for the project, opened its Town Branch Distillery last year. The process behind The Bourbon Barrel Project on Town Branch should be familiar to folks who followed Horse Mania in 2000 and 2010, or other mass public art projects presented by LexArts and others. Artists submitted proposals for barrels. LexArts whittled the 120 proposals to 80 and then presented them to prospective sponsors. Sponsors had a choice: Pay $5,000 to get the barrel made and retain ownership after the display was over; or pay $2,500 to get it made, displayed and offered for auction, with proceeds going to LexArts’ public art fund, other area arts and arts- oriented organizations and an honorarium for the artist. Last week wrapped up the process of matching barrels to sponsors; as of Friday afternoon, 29 are set to be made. At Tuesday’s sponsor reception, the remaining designs ran from purely visual designs to works that aimed to tell the stories of Lexington, bourbon and Town Branch. Several highlighted specific historic distilleries, primarily Pepper, although none focused on current operations. LexArts’ design guidelines prohibited designs that could be construed as advertising. Some were hearty endorsements of Kentucky bourbon, such as Carla Terwilleger’s colorful Old Pepper. Philip High’s Fire/Water played on a popular nickname for bourbon with a colorful blend of warm-hued flames and splashes of blue water. The phrase “barrel of monkeys” inspired numerous designs, including Melody Bock-Freeman’s Barrel of Monkeys With Shot Glass. Just as designs in previous projects did, some played on the local landscape and cityscape. For instance, Ann Kindl’s Main Attraction, sponsored by WLEX, features The Kentucky Theatre marquee. Some expand on the barrel form, such as The Lexington, a bourbon battleship by Damon Farmer, whose 2000 Horse Mania entry Stonewall sold at auction for a sale-topping $53,000. Wade Christensen’s Kentucky Roots, sponsored by the University of Kentucky Federal Credit Union, will feature a tree design above and below the barrel and, like all the barrels, will rest on its side on a stanchion. “I wanted them to be displayed in the same way they are when they are working and the bourbon is aging,” Clark says. There is the bonus that on their sides, the barrels cannot be used as tabletops or for other utilitarian functions. With the designs now selected, barrels are being distributed to artists. The next public step will be the preview of barrels Sept. 6 and 7. They will be set on the Town Branch trail Sept 10. Clark said the stands will include signs with QR codes that will allow viewers to get more information on the pieces and on the portion of Town Branch where they are. The barrels will remain on display for two months and then be sold at auction Nov. 16. After that, are there other Lexington icons to be turned into public art? What: Display of bourbon barrels designed by area artists along the Town Branch waterway that runs under downtown Lexington. ■ Aug. 23: Artists deliver completed barrels. ■ Sept. 6, 7: Public preview. ■ Sept. 10: Barrels go on display. ■ Nov. 16: Gala and auction. This entry was posted in News on July 29, 2013 by info.